Holy gloriousness!!! OwlCrate nailed it again! I thought I LOVED the December box (and really, I did! ), but I have to say, I loved the January box EVEN MORE! Just look at all the goodies, people! What a fabulous way to kick off another bookish year! 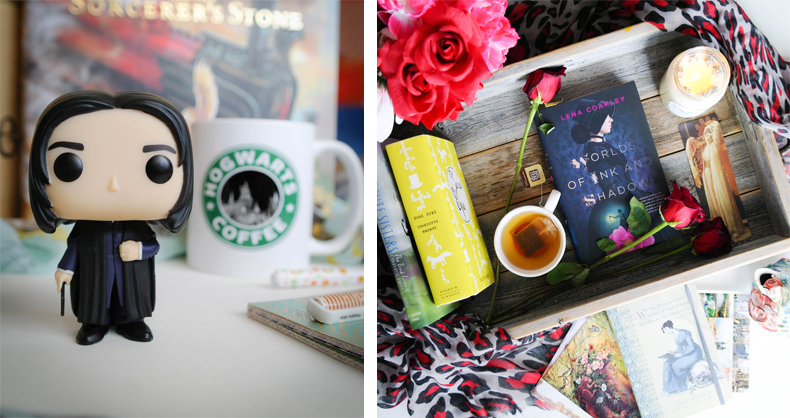 The theme of the January OwlCrate Box was MAGIC, and - as you can see - it really was a magical and beautiful box! Well, I might be biased, but I think this was the best box EVER! I was so happy with the choice of book, because I absolutely adore Lena Coakley! Lena's Witchlanders novel (YA fantasy) was one of the first few books I got for review as ARCs back in 2011. I was a newbie blogger then, we lived in Vancouver, I had no money to buy any books for myself so I was spending 80% of my free time perusing the local libraries! I started blogging about the books I read (Chaos Walking, Joe Hill's stuff, etc) and somehow got this ball of awesome rolling! The first package I got from an actual publisher contained Fury by Elizabeth Miles, Lena's Witchlanders, a book by Kieran Scott and one more that I can't recall now. I still get all teary eyed when I think about that! Good times! 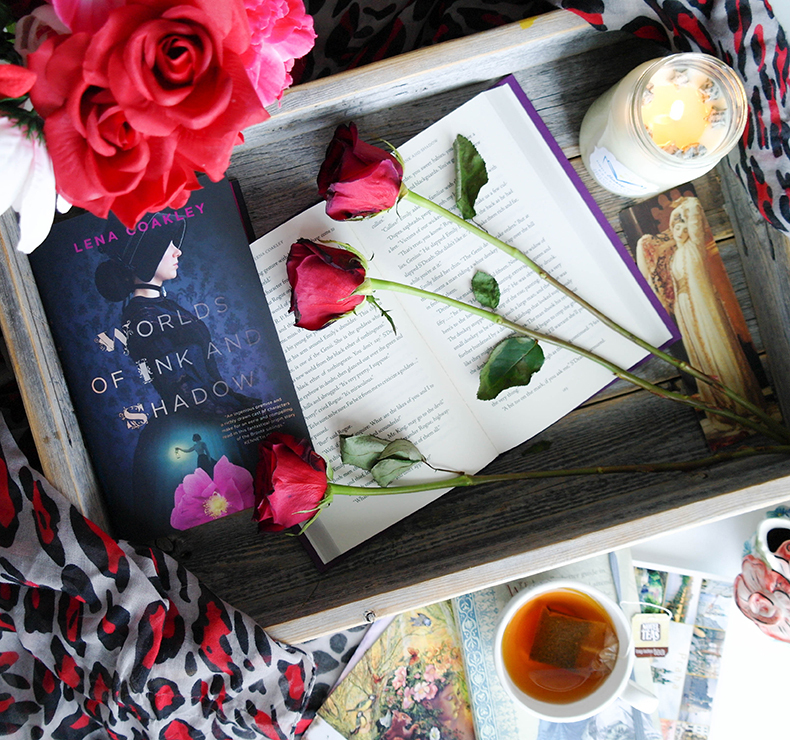 I really can't wait to read Worlds of Ink and Shadow, as it's a twist on Bronte sisters and it sounds fantastic! I have been hearing only great things about it! I thought the letter written by Lena herself was such a wonderful touch! As was the paper doll. Both very lovely additions to the book! The Lip Balm from Geek Fire Labs came in handy very quickly, as I got sick at the end of January and, as a result, my lips were very parched. It was lovely to be able to use this lip balm and it actually helped keep my lips moist! Plus, you really can't go wrong with White Chocolate flavor! Nope, it's absolutely DELIGHTFUL! I loved working on the designs for January's OwlCrate (seriously guys, Korrina and Robert are both amazing human beings and they put so much care into preparing their monthly boxes, they deserve all the praise and love! I love them so much, it's scary! Don't tell them that, tho, we don't want to scare them ^__-). I think the Throne of Glass print turned out pretty freaking awesome, if I say so myself. 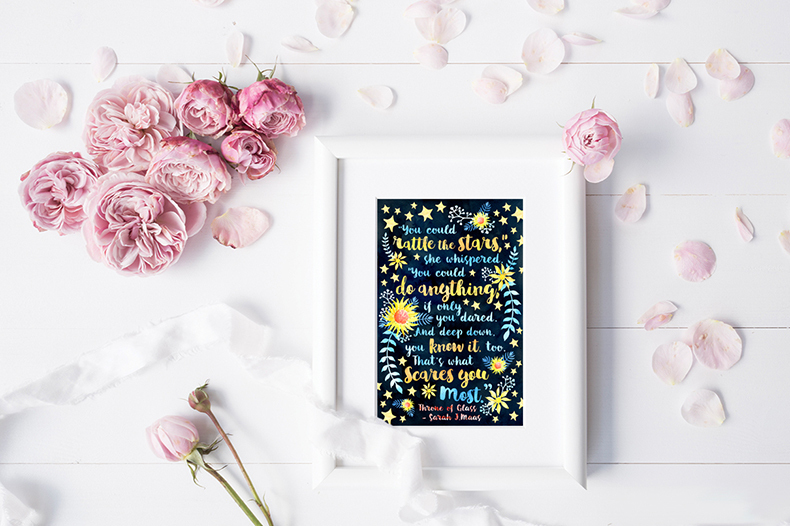 The quality of the print is gorgeous too, and I have already framed mine and will display it proudly from now on! The Raven Boys bookmark is darker and more eerie, but it was such a fantastic project too! My favorite side is the one that says TREES SPEAK LATIN. Which one is your favorite?! And last but not least, how awesome to have a Funko Pop! included in the box! 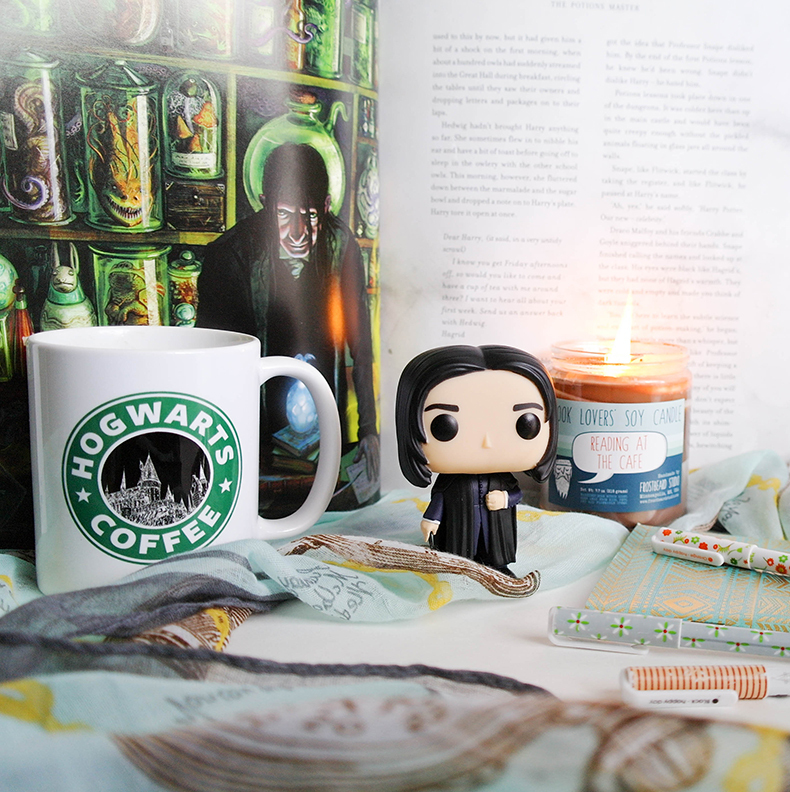 I applaud this wholeheartedly, I only have one other Funko so far (Dean Winchester, OF COURSE), so I was thrilled to see Snape in my box. SO HAPPY with the Funko I got! And it's gorgeous, it's fabulous, it's glorious!!! Oh! Almost forgot! The bonus eBook totally made my day, too. This was not an item that took place of something else, but simply an extra from the lovely OwlCrate team, which was so sweet and thoughtful of them! They really go the extra mile while putting their boxes together, so if you're looking for a bookish subscription box, trust me when I say - you won't find a better one! 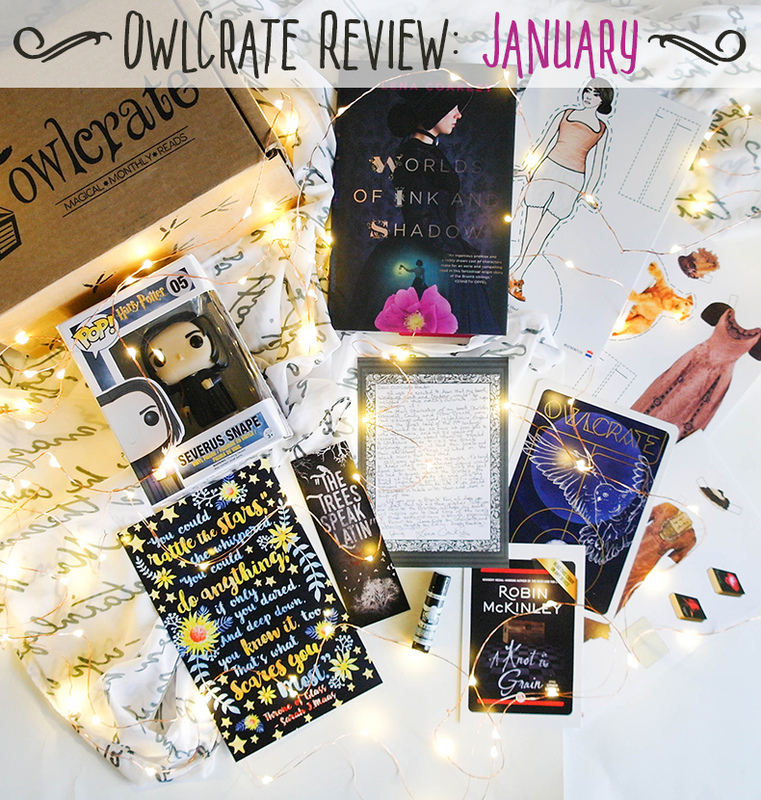 If you'd like to subscribe to OwlCrate (which I HIGHLY recommend), be sure to use code: ES2016 for 10% OFF your first box!